The African trypanosome causes African sleeping sickness, a hideous disease transmitted by the tsetse fly that, untreated, leads to character disintegration, comma and death. 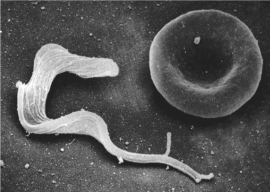 The trypanosome parasite evades the patient’s immune system by ‘antigenic variation’, which is the swapping one protective surface coat for another. In a recent publication in Nature Microbiology, Mike Ferguson’s group collaborated with Erec Stebbins and Nina Papavasiliou at the German Cancer Centre, Heidelberg, to describe another “trick of the tryp” – namely the sprinkling of sugar (or protein O-glycosylation, to be precise) onto some of the protective coats to make them much harder for the patient to make antibodies to. Good news for the parasite, but bad news for the patient.